— Reinhart Koselleck, “Historical Criteria of the Modern Concept of Revolution,” 1968. Revolution. Uprising. Insurrection. Insurgency. Revolt. Disobedience. Standing Ground. Occupy… If indeed it is true that, in politics, words are more important than any other weapon, then surely we must pay heed to what people say when they resist or revolt. We must explore the different modalities of uprising associated with these different concepts. Why? Because the term has become so fraught today. So historicized, so privileged, and raised so high above all its illegitimate children—resistance, revolt, insurgency, disobedience, hacktivism, standing ground… those peripheral, those ancillary, those sometimes aborted struggles for social change. So we changed course somewhat and called this series Uprising 13/13, deciding to focus on those other modalities in large part—but we could not do it without, first, theorizing and rethinking the notion of revolution. The essays we read for Uprising 1/13 on the modern concept of revolution—namely, Reinhart Koselleck’s “Historical Criteria of the Modern Concept of Revolution,” Marx’s Eighteenth Brumaire of Louis Bonaparte, Etienne Balibar’s “The Idea of Revolution,” Simona Forti’s “The Modern Concept of Revolution,” and Gayatri Chakravorty Spivak’s “Global Marx”—provide a number of key insights into the complexity of thinking about revolution today. The starting point, naturally, is Koselleck’s original etymological elaboration of the ancient concepts of revolution—revolution as the cyclical returning to the point of origin, as the astronomical cycle of the stars, as the ancient philosophical progression of constitutions (from monarchy to its dark twin tyranny, to aristocracy and then oligarchy, and finally democracy and ultimately ochlocracy, or mass rule) (Koselleck 2004:45). Koselleck argued that what marks the modern conception of revolution is the passage from the notion of political to social revolution: the idea that a revolution is about social change, about “the social emancipation of all men, [about] transforming the social structure” (Koselleck 2004:52). Koselleck drew a contrast between the modern 16th and 17th century conception of revolution and the earlier Middle Age uses of terms such as uprising, revolt, riot, insurrection, rebellion, and civil war (Koselleck 2004:47). The latter were connected to a different form of struggle, one that was marked by religious confrontations and inquisitorial struggles. “Civil war, guerre civile, Bürgerkrieg—these were the central concepts by which the suffering and experience of fanatical confessional struggles were precipitated, by means of which, moreover, they were legally formulated” (Koselleck 2004:47). Etienne Balibar traces a different genealogy, this time back to the Eurocentrism of the modern conception of revolution: the contrast, on his view, is between notions of citizenship embedded in the concept of revolution and ideas of the colonial subject embedded in the notion of uprising or insurgency. For Balibar, revolution relates to uprisings in the same way that the core relates to the periphery: “In the dominated colonial peripheries,” Balibar writes, “there were no ‘revolutions’ but only ‘resistances,’ ‘guerillas,’ uprisings’ and ‘rebellions’” (Balibar 2016:*3). In contrast to these latter peripheral uprisings, the great revolutions of the 19th century “were supposed to be political processes typical for the center because they involve a participation of ‘citizens’ who exist only in the nation-states” (Balibar 2016:*3). Marx’s classic essay from 1851-52, Eighteenth Brumaire, becomes important here, as a philosophical demonstration of Marx’s philosophy of history as it relates to revolution. The essay reflects, on the one hand, how it might be possible to actualize, philosophically, a materialist conception of history, as evidenced by the unfolding of the various stages of political upheaval—from the first more popular period, from February to May 1848, that proclaimed a social republic, to the second more bourgeois period, from May 1848 to May 1849, that laid the foundations for a bourgeois republic, and so on, to the bourgeois republic, the June insurrection, the parliamentary republic, and ultimately Bonaparte’s coup de main of December 1 and 2, 1851. 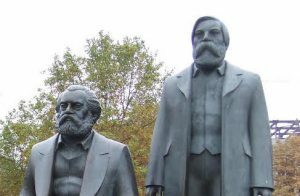 The historical periodization itself is a tour de force that instantiates Marx’s entire philosophical method. But simultaneously, on the other hand, Marx’s essay expresses his faith in history and his conviction that the failures of the 1848 revolution serve as the foundations of a coming revolution. The metaphor of the “old mole” drawn from Shakespeare’s Hamlet and Hegel’s Lectures on the History of Philosophy—of the old mole that burrows itself until completion, only to break through the crust of the earth when all the work is done—is a most powerful expression of faith in the ultimate success of the revolution. “Well grubbed, old mole!” (Marx 1978:606). Well grubbed, indeed. What faith in the “laws of movement of history,” as Arendt would say! Koselleck’s own relation to revolution becomes clear in his text, which evinces a certain pessimism or disheartedness–as when he asks, in a plea-full way: “Has not the ‘world revolution’ been reduced to an empty formula which can be appropriated pragmatically by the most diverse groups of countries and flogged to death?” (Koselleck 2004:26). In this context, Simona Forti develops a powerful argument, against the singular collective experience that produces a concept of revolution, for a multiplicity of revolutionary spaces. Drawing on Arendtian strands, Forti envisages a space for more polyvalent conceptions of revolutions that represent, in her words, “a new political space, a space of horizontal participation, against any social, historical, and natural determinism” (Forti 2017). These texts raise provocative questions about the meaning of revolution today, and push us to interrogate more deeply, as we did in Uprising 1/13, the modern concept of revolution. This seminar discussed two texts: Reinhardt Koselleck’s chapter,“Historical Criteria of the Modern Concept of Revolution,” from Futures Past: On the Semantics of Historical Time, and Karl Marx’s 18 Brumaire of Louis Napoléon. Both texts can be found in the readings for Uprising 1/13, in the right column here. Also, please read the remarkable posts by our guests, also in the right column here.